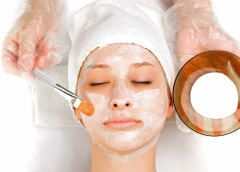 esthetician; a person with special training in administering facials, aromatherapy, hair and skin care, makeup, etc. Skin care technologies have been developed over the years to treat a number of skin abnormalities and restore affected skin to its natural condition. We provide a number of treatments specifically developed for use with any skin type or skin condition for positive and satisfactory results, whether you suffer from “dry skin,” “oily skin,” “combination skin” or other. We use Seacrets Products, for more information about products click here.